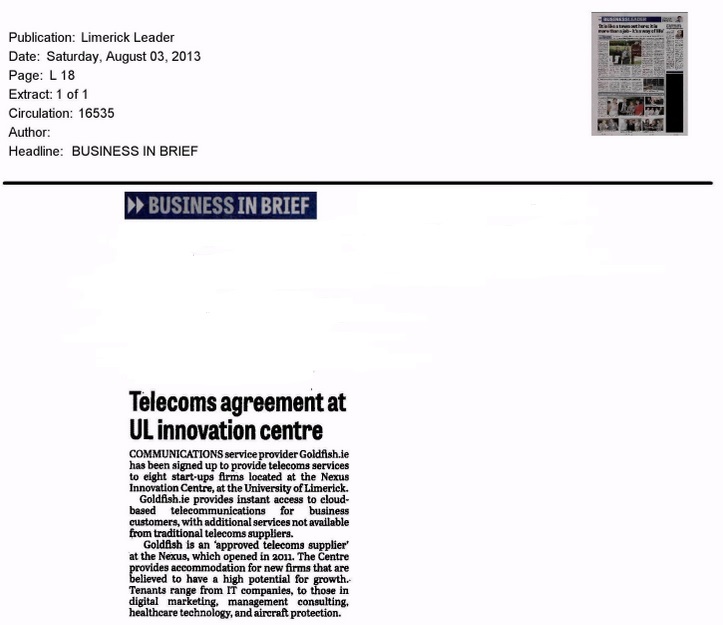 Our new clients at the University of Limerick’s Nexus Innovation Centre (NIC), got local coverage in today’s Limerick Leader newspaper. The NIC is an incubation centre which supports start-up companies that emanate from ideas fostered at the University. Double click above to zoom. 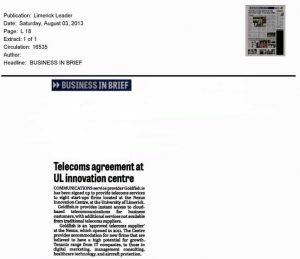 Communications service provider Goldfish.ie has been signed up to provide telecoms services to eight start-up firms located at the Nexus Innovation Centre, at the University of Limerick. Goldfish.ie provides instant access to cloud-based telecommunications for business customers, with additional services not available from traditional telecoms suppliers. Goldfish is an ‘approved telecoms supplier’ at the Nexus, which opened in 2011. The Centre provides accommodation for new firms that are believed to have high potential for growth. Tenants range from IT companies, to those in digital marketing, management consulting, healthcare technology, and aircraft protection.